For me, Pet Sematary has always been one of Stephen King’s scariest novels. When I first read it nearly thirty years ago, it really got under my skin. I also enjoyed the 1989 film adaptation of PET SEMATARY. While I didn’t really see the need for a remake, considering the source material, I felt, well, why the heck not? So I went into the theater to see this one with fairly enthusiastic expectations. PET SEMATARY (2019) tells a tale that remains chilling today. Dr. Louis Creed (Jason Clarke) and his wife Rachel (Amy Seimetz) relocate their family— eight year-old daughter Ellie (Jete Laurence), three year-old son Gage (twins Hugo and Lucas Lavoie) and cat Church— from Boston to rural Maine in order to slow their lives down and spend more time with each other. Not long after they settle in, Ellie discovers a strange “pet sematary” in the woods in the back of their property, and their neighbor Jud (John Lithgow) explains that it’s been there for years, a place where the local children bury their dead pets. Cemetery is spelled “sematary” because in the past the children had misspelled the sign. In front of their home is a rural road where huge trucks roar by at speeds which seem to rival supersonic jets. These rigs also don’t tend to make any noise until they’re right on top of the property. Not very realistic. I live on a rural road. You can hear the rumble of trucks coming from a distance. Anyway, when Church is killed on that road, to spare Ellie heartbreak, Jud shows Louis another cemetery, this one located deeper in the woods behind the pet sematary, and advises Louis to bury the cat there, without telling him why. The next day, the cat returns, alive, but very different, aggressive, and not very agreeable. Jud then explains to Louis the secret of the second cemetery, that things buried in the soil there return. Of course, they don’t return the same. Later, when Ellie is tragically killed by one of those monstrous rigs racing along the rural highway, Louis decides his daughter has been taken from him too quickly, and against his better judgment, buries her in the pet sematary, knowing that she will return. Oh, the things that parents will do for their children! As I said, Pet Sematary has always been for me one of Stephen King’s scariest novels, mostly I think because of the pain of the parents’ grief and the knowledge that what Louis is about to do will end badly for everyone involved. One of the biggest weaknesses of this new movie version of PET SEMATARY is that somehow, in spite of the frightening source material, it’s simply not that scary. Part of this is the changes made to the story. Then there’s the dialogue which isn’t very sharp, and lastly the film simply fails to capitalize on the true horror aspects of the novel. Let’s start with the first half of the film, before anything or anyone is buried. Directors Kevin Kolsch and Dennis Widmyer don’t really take advantage of the natural creepy elements here. When Elle first discovers the cemetery, she initially sees some local children wearing masks taking their pet there, images which should be weird and creepy, but they hardly register as such since we see them so briefly. When Louis fails to save a dying student at the clinic, a plot point that is critical in the novel, the victim Victor Pascow returns numerous times to warn Louis against his involvement with the sematary. These scenes also barely register here. Neither do the flashback scenes with Rachel and her sister who was suffering from spinal bifida. These scenes were unnerving in the novel. They’re rushed and glossed over here in the movie. Once Louis learns about the pet sematary, and after seeing how disastrous the return of Church proved to be, it really strained believability that— regardless of how much he missed his daughter— that he would bury her there. He’s gotta know how she will be when she returns. The film failed to convince me that a grieving father would feel this is a good idea. It’s not like there’s a chance she’d come back normal. The film makes it abundantly clear that it’s not going to happen. The change here having Ellie killed and resurrected rather than Gage didn’t really add anything new to the story, other than giving Ellie a bit more to do when she eventually comes back. I can’t say I was all that impressed by the screenplay by Matt Greenberg, based of course on the Stephen King novel. I could give or take the changes made to the story, including the ending, as nothing new here did all that much for me, and the parts that stuck to the original simply weren’t told with any sort of conviction. There was something very flat about the whole production. Jason Clarke, who’s been in a ton of movies, including an excellent performance as Ted Kennedy in CHAPPAQUIDDICK (2018), is an actor I like a lot. He’s very good here as Louis Creed, although again, I simply did not believe he’d think burying his daughter in the pet sematary was a good idea. Clarke also turned in notable performances in the genre films TERMINATOR GENISYS (2015) and DAWN OF THE PLANET OF THE APES (2014). Amy Seimetz is okay as Rachel, but as written, the character strangely doesn’t figure as prominently in the story as one would expect. Young Jete Laurence is very good as Ellie, and she is admittedly rather creepy when she returns from the grave. John Lithgow is sufficiently earthy as lifelong Maine resident Jud, but one of the highlights from the 1989 film was Fred Gwynne’s performance as the character. Gwynne, who was forever typecast and remembered as Herman Munster on THE MUNSTERS (1964-66) delivered an outstanding performance in that 1989 film that was one of the best parts of the movie. Lithgow here did not make me forget about Gwynne. I can’t say that I liked this new version of PET SEMATARY all that much. It’s not as good as the 1989 film, and it’s nowhere near as scary as King’s novel. It’s passable horror entertainment, but since it fails to convince its audience that its main character would indeed take the drastic steps he does to resurrect his deceased daughter, the film never really resonates or becomes more than just a standard by-the-numbers horror vehicle. Stephen King fans deserve better. Peter Cushing and the Skull in THE SKULL (1965), a horror film in which Cushing did not play a doctor. Welcome back to THE HORROR JAR, that column where we look at lists of odds and ends pertaining to horror movies. Up today, my all time favorite horror movie actor, Peter Cushing. When you think of Peter Cushing, his two most famous roles immediately come to mind, Baron Frankenstein and Dr. Van Helsing, two characters who were also both doctors. In fact, a lot of Cushing’s roles in horror movies were of medical doctors, professors, or scientists. So much so, that I thought: when did he not play a doctor? Here’s a look at those roles, the times Peter Cushing starred in a horror or science fiction film but did not play a doctor or scientist. THE HOUND OF THE BASKERVILLES (1959) – Sherlock Holmes. Technically not a horror film, but that being said, Hammer Films added plenty of horror elements to their rendition of the Sir Arthur Conan Doyle tale. Directed by Terence Fisher, with Cushing as Sherlock Holmes and Christopher Lee as Sir Henry Baskerville. Superior little movie, atmospheric and full of thrills, with Cushing’s energetic Holmes leading the way. Cushing as Holmes in THE HOUND OF THE BASKERVILLES (1959). NIGHT CREATURES (1962) – Rev. Dr. Blyss – even though the character is identified in the credits as “Dr. Blyss” he’s really the vicar of the small village of Dymchurch— check that, he’s actually the infamous pirate Captain Clegg, hiding out, posing as the vicar, while secretly smuggling rum in this rousing adventure/horror tale by Hammer Films. Cushing at his energetic best. Peter Cushing delivers one of his best performances, as Captain Clegg/Dr. Blyss in NIGHT CREATURES (1962). SHE (1965) – Major Holly – lost cities, a supernatural woman, and lots of action in this fantasy adventure by Hammer Films. THE SKULL (1965) – Christopher Maitland – plays a private collector interested in the occult who purchases the skull of the Marquis de Sade with deadly results. Christopher Lee co-stars as Cushing’s rival in this fine horror film by Hammer’s rival, Amicus Productions. TORTURE GARDEN (1967) – Lancelot Canning – another film by Amicus, this one an anthology film featuring five horror stories based on the works of Robert Bloch. Cushing appears in the fourth segment, “The Man Who Collected Poe,” once more playing a collector of the macabre. Jack Palance co-stars with Cushing in this segment. THE BLOOD BEAST TERROR (1968) – Inspector Quennell- One of Peter Cushing’s worst movies. In fact, Cushing himself considered it his worst. Produced by Tigon Films, a company that tried to join Hammer and Amicus as a voice in British horror but ultimately failed. The monster is a woman who turns into a giant moth that preys on men’s blood, and Cushing plays the police inspector (in a role originally written for Basil Rathbone) who tries to stop her. SCREAM AND SCREAM AGAIN (1970) – Major Heinrich Benedek – pretty much just a cameo in this film, famous for being the first time Peter Cushing, Christopher Lee, and Vincent Price all starred together in the same movie. A bizarre flick, perfect for 1970, but ultimately a disappointment as Cushing and Lee only appear briefly, while Price gets a bit more screen time. THE VAMPIRE LOVERS (1970) – General von Spielsdorf – Cushing finally appears in a vampire movie where he’s not a doctor or a professor! This time he’s a general, but he’s still hunting vampires in this atmospheric and very sensual vampire film from Hammer, starring Ingrid Pitt as the vampire Carmilla. The first of Hammer’s “Karnstein” vampire trilogy. THE HOUSE THAT DRIPPED BLOOD (1971) – Philip Grayson – Another anthology film by Amicus. Cushing stars in the second segment “Waxworks” and plays a retired stockbroker who runs afoul of a nefarious wax museum. Director Peter Duffell once said in an interview that Peter Cushing’s entire segment in this film was simply a contrivance to place his head on a platter, which remains one of the more shocking images from the film. TWINS OF EVIL (1971) – Gustav Weil – Cushing is excellent (as he always is) in this vampire film from Hammer, playing a different kind of vampire hunter. He leads the Brotherhood, a fanatical group of men seeking out witches in the countryside, a group that is every bit as deadly as the vampires. As such, when the vampire threat becomes known, and the Brotherhood turn their attention to the undead, it makes for a much more interesting dynamic than the typical vampire vs. heroes. It’s one of Cushing’s most conflicted roles. There’s a scene where he laments that he only wanted to do the right thing, that really resonates, because for most of the film, he’s been doing the very worst things. The third “Karnstein” vampire film. Peter Cushing as the fanatical Gustav Weil in TWINS OF EVIL (1971). I, MONSTER (1971) – Utterson – plays a lawyer in this version of the Dr. Jekyll and Mr. Hyde tale by Amicus, which changed the names of Jekyll and Hyde to Marlowe and Blake, played here by Christopher Lee. TALES FROM THE CRYPT (1972) – Arthur Edward Grimsdyke – famous Cushing role in yet another anthology film by Amicus. Cushing appears in the third segment, “Poetic Justice” where he plays an elderly junk dealer who is terrorized into suicide by his neighbors, but a year later, and this is why the role is famous, he returns from the grave. DR. PHIBES RISES AGAIN (1972) – Captain – cameo in this Vincent Price sequel. Blink and you’ll miss him. ASYLUM (1972) – Smith – appears in the segment “The Weird Tailor” in this anthology film by Amicus. FEAR IN THE NIGHT (1972) – The Headmaster – plays a sinister headmaster, in this thriller written and directed by Jimmy Sangster, and also starring Joan Collins and Ralph Bates. FROM BEYOND THE GRAVE (1974) – The Proprietor – plays the owner of an antique shop, and the man in the wraparound story in this Amicus anthology horror vehicle. MADHOUSE (1974) – Herbert Flay – plays a screenwriter in this one, and best friend to Vincent Price’s horror actor Paul Toombes. Toombes is having a rough go of it, as the character he played in the movies- Dr. Death – seems to be committing murders in real life. A really interesting movie, not a total success, but definitely worth a look, mostly because Price and Cushing share equal and ample screen time in this one. TENDRE DRACULA – Macgregor – bizarre ill-conceived French horror comedy, notable for featuring Cushing’s one and only performance as a vampire. LAND OF THE MINOTAUR (1976) – Baron Corofax – plays the villain to Donald Pleasence’s heroic priest in this tale of devil worship and demons. STAR WARS (1977) – Grand Moff Tarkin – aside from his work in Hammer Films, the role which Cushing is most known for. As Tarkin, he’s the one character in the STAR WARS universe who bossed Darth Vader around and lived to tell about it. Peter Cushing as Grand Moff Tarkin in STAR WARS (1977). SHOCK WAVES (1977) – SS Commander – Nazi zombies attack! Nuff said. With John Carradine. THE UNCANNY (1977) – Wilbur – Cushing plays a writer who learns that cats are a little more “active” than he first imagined in yet another horror anthology film. MYSTERY ON MONSTER ISLAND (1981) – William T. Kolderup – plays the “richest man in America” in this bizarre horror comedy. HOUSE OF THE LONG SHADOWS (1983) – Sebastian Grisbane – famous teaming of Peter Cushing, Christopher Lee, Vincent Price, and John Carradine in the same movie for the first (and only) time ever, this really isn’t a very good movie. It tries hard, and ultimately isn’t all bad, but could have been so much better. Price and Lee fare the best. SHERLOCK HOLMES AND THE MASKS OF DEATH (1984) – Sherlock Holmes – Holmes comes out of retirement to solve a case. Again, not horror, per se, but since this film was directed by Roy Ward Baker, written by Anthony Hinds, and of course starred Peter Cushing, there is a definite Hammer Films feel about this movie. John Mills plays Dr. Watson. There you have it. A list of genre films starring Peter Cushing where he did not play a doctor, scientist or professor. Perhaps next time we’ll have a look at those films where he did don a lab coat or carry a medical bag. IT FOLLOWS – *** – by far, the best horror film of the year. If you see one horror movie this year, make it this one. It plays like a John Carpenter film from the 1970s. Probably my favorite thing about this movie by writer/director David Robert Mitchell is its plot which is unlike most other horror films. Not gory at all, but suspenseful and captivating throughout. Very stylish. THE VISIT- *** – Who knew this M. Night Shyamalan movie about two children visiting their increasingly odd grandparents would be so good? After a string of misfires, Shyamalan pushes all the right buttons with this one, capturing the perfect blend of horror and humor. KRAMPUS – *** – another flick I expected not to like that turned into one of the better horror movies of the year. This Christmas horror movie in spite of its potentially ridiculous storyline gets the horror right and makes the most of its creepy images and suspenseful scenes. It’s a holiday comedy with a serious horrific attitude. Check this one out. JURASSIC WORLD – ***- technically not really a horror film, but it does contain some angry hungry dinosaurs. This one is mostly light in tone, but I found it entertaining throughout, and I really enjoyed Chris Pratt’s performance. THE WOMAN IN BLACK 2: THE ANGEL OF DEATH- ** 1/2 – I liked this sequel to the well-made THE WOMAN IN BLACK (2012). I enjoyed the atmosphere and the cinematography more than the story. A Hammer Film. UNFRIENDED – ** 1/2 – I thought I would hate this one, but the gimmick of having all the action appear on a computer screen actually works, mostly because audiences today all use computers/laptops/smartphones and so watching this type of screen seemed perfectly natural, even if its story of high school friends tormented online isn’t very compelling. Not half bad. THE GREEN INFERNO – ** 1/2 – not my cup of tea, but this Eli Roth tale of cannibalism actually features likable characters and a decent story. NOT FOR THE SQUEAMISH. VICTOR FRANKENSTEIN – ** – ultimately disappointing tale of Frankenstein, told from the perspective of Igor. So why not call this one Igor? Best part is Daniel Radcliffe’s performance as Igor. Tries to be upbeat and action-oriented, a la the Robert Downey Jr. Sherlock Holmes movies, but doesn’t really work. MAGGIE – ** – Arnold Schwarzenegger in a zombie movie? Is it full of brutal kills and big gun violence? Not at all. This is actually a low-key drama about Arnold caring for his teen daughter who’s slowly turning into a zombie. Slow moving and quiet. Worth it if you’re in the right frame of mind. CRIMSON PEAK- ** – good looking horror movie is undone by a dumb story that ultimately makes little sense. The main character in this ghost story is supposed to be a strong smart heroine, and yet she’s the only person in the movie who can’t see the danger around her. INSIDIOUS CHAPTER 3- ** – didn’t like this third chapter in the INSIDOUS series at all. I’m just not a big fan of prequels, especially when they’re as poorly written as this one. THE LAZARUS EFFECT – * 1/2 -weak horror movie about a “Frankenstein”- like experiment to reanimate the dead. If only this movie could be reanimated. SINISTER 2 – * 1/2 – utterly horrible sequel. Story makes little sense nor is it scary. THE GALLOWS – * – my pick for the Worst Horror Movie of the Year. How dumb is this one? Well, the main plot point is that in honor of the 20th anniversary of a high school play gone wrong— a student was accidentally hanged to death on stage- the school decides to put on the same play again. Duh! Needless to say, someone isn’t very happy about this decision, and once again more students turn up dead. Unfortunately none of them were responsible for the script. There you have it. My list of horror movies from 2015. Here’s my latest IN THE SPOOKLIGHT column, on the George Romero classic NIGHT OF THE LIVING DEAD (1968), published in the October 2014 edition of The Horror Writers Association Newsletter. Today we have THE WALKING DEAD. 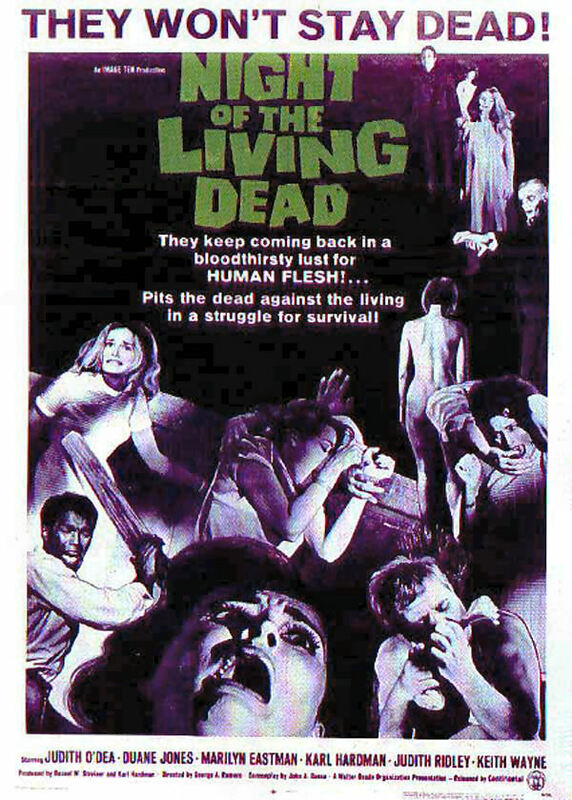 But years ago, the zombie phenomenon which swept the nation was NIGHT OF THE LIVING DEAD (1968). George Romero’s cult classic from 1968 is more than just a superior horror film: it’s a landmark film that inspired a genre. It’s the film that put zombie movies on the map, or at least the modern zombie movie. Before NIGHT OF THE LIVING DEAD, zombie movies, while still a genre, with classic films like WHITE ZOMBIE (1932) starring Bela Lugosi, and Val Lewton’s I WALKED WITH A ZOMBIE (1943) were hardly a major player in the horror movie canon. NIGHT OF THE LIVING DEAD changed all that. In truth, THE WALKING DEAD, the mega hit TV show on AMC, can thank NIGHT OF THE LIVING DEAD for re-defining the parameters of the genre. NIGHT OF THE LIVING DEAD is the movie that first showed the walking dead eating the bodies of the living in graphic grotesque detail, and it’s one of the first films to deal with the zombie apocalypse. Best-selling author Craig Shaw Gardner tells a neat story about first seeing NIGHT OF THE LIVING DEAD in the 1960s at the movies at the tail end of a triple feature, following THE CURSE OF FRANKENSTEIN (1957) and HORROR OF DRACULA (1958). Now that’s a triple feature I wish I had gone to see! Gardner recounts that when NIGHT OF THE LIVING DEAD started, he and his buddies almost left the theater because the film was in black and white, and they thought it was going to be a cheapie B-movie, but they stayed, and they were rewarded by one of the scariest movies they had ever seen. In large part, NIGHT OF THE LIVING DEAD works so well because it is so unlike the other horror films of the decade. For ten years England’s Hammer Films dominated the horror market with their opulent period piece thrillers and Frankenstein and Dracula sequels starring Peter Cushing and Christopher Lee. At the same time Vincent Price was matching them fright for fright with his appearances in the 1960s Roger Corman Edgar Allan Poe movies. But in 1968, NIGHT OF THE LIVING DEAD, along with Roman Polanski’s ROSEMARY’S BABY, bucked the trend and started something new. Gone were the formulaic horror movies of yesterday. In their place, at least in the case of NIGHT OF THE LIVING DEAD, was a low budget newsreel quality flick that was as unpredictable and jarring as it was graphic and violent. Like John Carpenter’s HALLOWEEN (1978) would do ten years later, NIGHT OF THE LIVING DEAD burst unannounced onto the horror scene and single-handedly carved out a brand new genre of horror movie. In the case of HALLOWEEN, it was the slasher flick, and with NIGHT OF THE LIVING DEAD, it was the zombie movie. But unlike HALLOWEEN and other trend-setting horror movies, films like THE EXORCIST (1973), JAWS (1975) and THE BLAIR WITCH PROJECT (1999), success for NIGHT OF THE LIVING DEAD didn’t happen overnight. In fact, NIGHT OF THE LIVING DEAD was not a box office smash but instead became a cult hit as it was a drive-in movie favorite and a midnight movie mainstay for years and years. Romero himself didn’t make a sequel until ten years later, with DAWN OF THE DEAD (1978). The low budget style works to the film’s advantage, as there is a realistic feel throughout. It makes you believe that the zombie apocalypse might truly be happening. Of course, the main reason NIGHT OF THE LIVING DEAD succeeds in spite of its low budget is the stylish direction by George Romero. It has no-name actors, and it’s shot nearly all in one place, at a farmhouse, but there’s nothing cheap about the way this one is crafted. In fact, the opposite is true. Romero’s direction is almost art-house level. NIGHT OF THE LIVING DEAD tells a simple story. A young woman name Barbra (Judith O’Dea) and her brother are attacked by a zombie in a graveyard. Her brother is killed, and while she’s still in shock, she escapes to a farmhouse where she meets another man Ben (Duane Jones) who is also fleeing from the reanimated dead. There are also more people hiding out in this house, and the rest of the film chronicles their efforts to ward off the attacking zombies while trying to learn why all of this is happening. NIGHT OF THE LIVING DEAD is as dark a horror movie as you’re going to find, and it still works today. It’s brutal storyline and shock effects still hold up rather well, even for modern audiences. Romero does a tremendous job at the helm, keeping this film suspenseful throughout, as it builds up to its horrific graphic conclusion. The screenplay by Romero and John A. Russo tells a flat out in-your-face terror tale, but it also does something more, as it also serves as a reflection of the turbulent times of the 1960s. It was released in 1968, one of the more violent years in American history, with the assassinations of both Robert Kennedy and Martin Luther King, Jr. There was also the Vietnam War, and racial tensions were heating up. With the main character Ben being a black male, pretty much unheard of in 1968, especially in horror movies (Sidney Poitier wasn’t doing the horror film thing) the film really delves into race relations, especially in light of how this movie ends. Interestingly enough, the character was originally written to be quite different. Ben was going to be a rough and crude truck driver, but when the studious looking Duane Jones auditioned for the part, the role was re-written for him. Seriously, I can’t imagine the ending packing the same wallop with a white truck driver Ben. The film’s ending blows you out of the water because Ben is black. It lifts all that has come before it to another level entirely, and makes NIGHT OF THE LIVING DEAD something far more than just a straightforward horror movie. Very few horror movies can make this claim. Also of note, the word “zombie” is never used in the film. The zombies are referred to as either “those things” or ghouls. TV’s THE WALKING DEAD has also borrowed from the same playbook, as they don’t use the word zombie in their show either. This Halloween season, while you’re enjoying the latest episodes of THE WALKING DEAD, remember the film that inspired it, the one that created the movie zombie as we know it today: NIGHT OF THE LIVING DEAD. They’re coming to get you, Barbra!